How can I create a publication-quality graphic and customize plot parameters? Assign custom names to bands in a RasterStack. Customize raster plots using the ggplot2 package. This episode covers how to customize your raster plots using the ggplot2 package in R to create publication-quality plots. Although this plot is informative, it isn’t something we would expect to see in a journal publication. The x and y-axis labels aren’t informative. There is a lot of unnecessary gray background and the titles of each panel don’t clearly state that the number refers to the Julian day the data was collected. In this episode, we will customize this plot above to produce a publication quality graphic. We will go through these steps iteratively. When we’re done, we will have created the plot shown below. The first thing we will do to our plot remove the x and y-axis labels and axis ticks, as these are unnecessary and make our plot look messy. We can do this by setting the plot theme to void. Next we will center our plot title and subtitle. 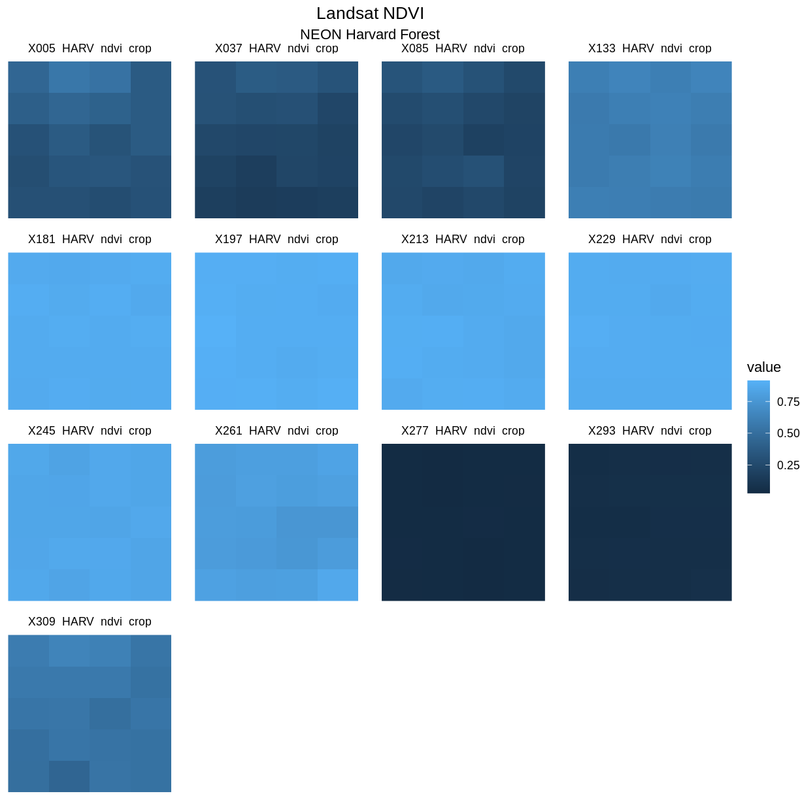 We need to do this after the theme_void() layer, because R interprets the ggplot layers in order. If we first tell R to center our plot title, and then set the theme to void, any adjustments we’ve made to the plot theme will be over-written by the theme_void() function. So first we make the theme void and then we center the title. We center both the title and subtitle by using the theme() function and setting the hjust parameter to 0.5. The hjust parameter stands for “horizontal justification” and takes any value between 0 and 1. A setting of 0 indicates left justification and a setting of 1 indicates right justification. Change the plot title (but not the subtitle) to bold font. You can (and should!) use the help menu in RStudio or any internet resources to figure out how to change this setting. Learners can find this information in the help files for the theme() function. The parameter to set is called face. Next, let’s adjust the color ramp used to render the rasters. First, we can change the blue color ramp to a green one that is more visually suited to our NDVI (greenness) data using the colorRampPalette() function in combination with colorBrewer. Then we use scale_fill_gradientn to pass the list of colours (here 20 different colours) to ggplot. "#FFFFE5" "#F7FCB9" "#D9F0A3" "#ADDD8E" "#78C679" "#41AB5D" "#238443"
Then we will pass those color codes to the colorRampPalette function, which will interpolate from those colors a more nuanced color range. We can tell the colorRampPalette() function how many discrete colors within this color range to create. In our case, we will use 20 colors when we plot our graphic. 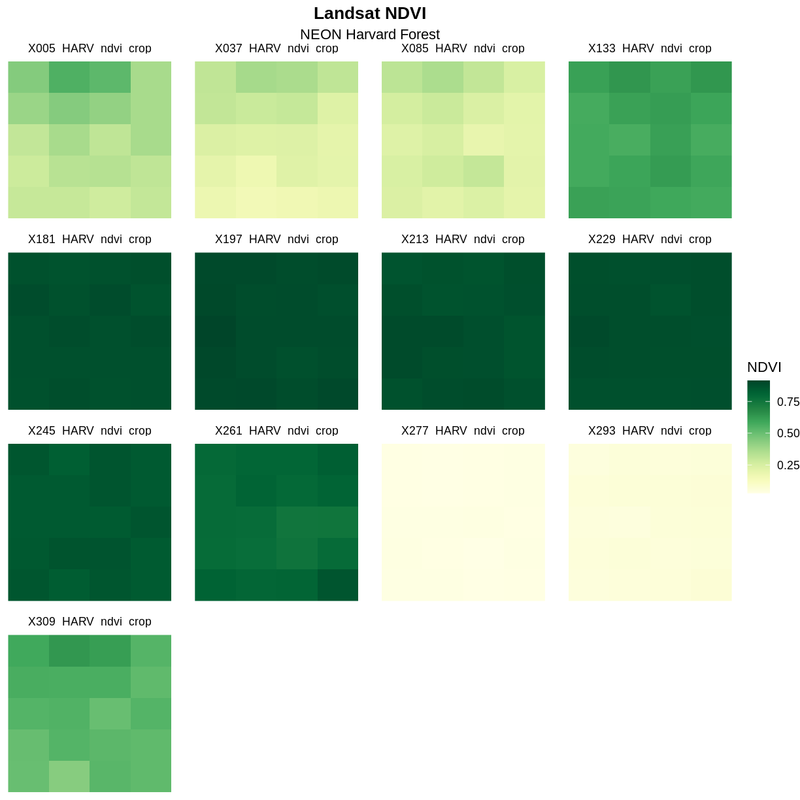 The yellow to green color ramp visually represents NDVI well given it’s a measure of greenness. Someone looking at the plot can quickly understand that pixels that are more green have a higher NDVI value. For all of the brewer.pal ramp names see the brewerpal page. Next, let’s label each panel in our plot with the Julian day that the raster data for that panel was collected. The current names come from the band “layer names”” stored in the RasterStack and the first part of each name is the Julian day. To create a more meaningful label we can remove the “x” and replace it with “day” using the gsub() function in R. The syntax is as follows: gsub("StringToReplace", "TextToReplaceIt", object). Now we will use the gsub() function to find the character string “_HARV_ndvi_crop” and replace it with a blank string (“”). We will assign this output to a new object (raster_names) and look at that object to make sure our code is doing what we want it to. "X005" "X037" "X085" "X133" "X181" "X197" "X213" "X229" "X245" "X261"
So far so good. Now we will use gsub() again to replace the “X” with the word “Day” followed by a space. "Day 005" "Day 037" "Day 085" "Day 133" "Day 181" "Day 197" "Day 213"
 "Day 229" "Day 245" "Day 261" "Day 277" "Day 293" "Day 309"
Once the names for each band have been reassigned, we can render our plot with the new labels using alabeller. We can adjust the columns of our plot by setting the number of columns ncol and the number of rows nrow in facet_wrap. Let’s make our plot so that it has a width of five panels. Now we have a beautiful, publication quality plot! Label each tile “Julian Day” with the julian day value following. Change the color ramp to a divergent brown to green color ramp. 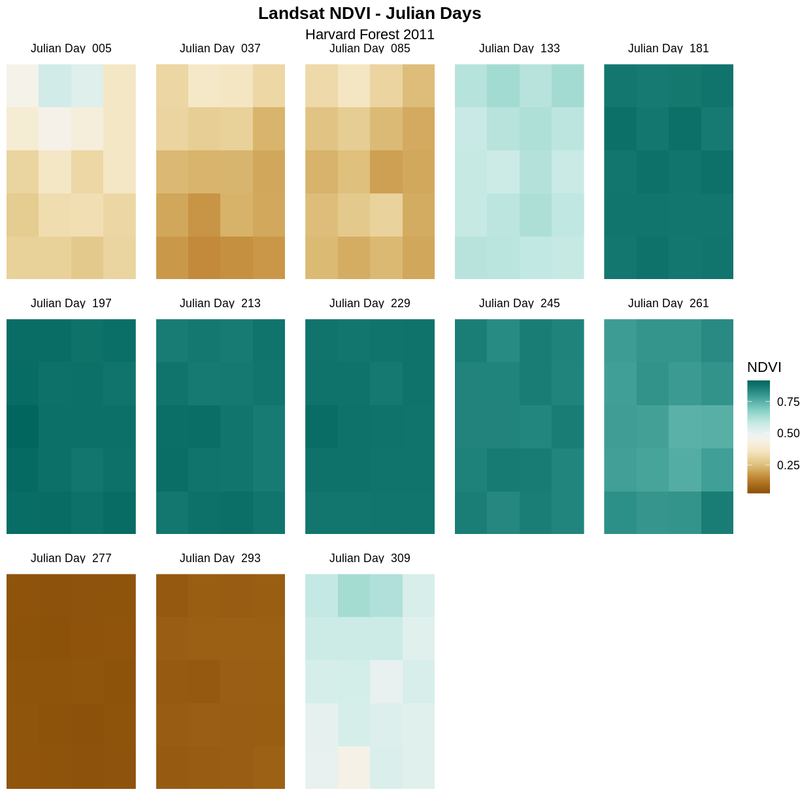 Questions: Does having a divergent color ramp represent the data better than a sequential color ramp (like “YlGn”)? Can you think of other data sets where a divergent color ramp may be best? 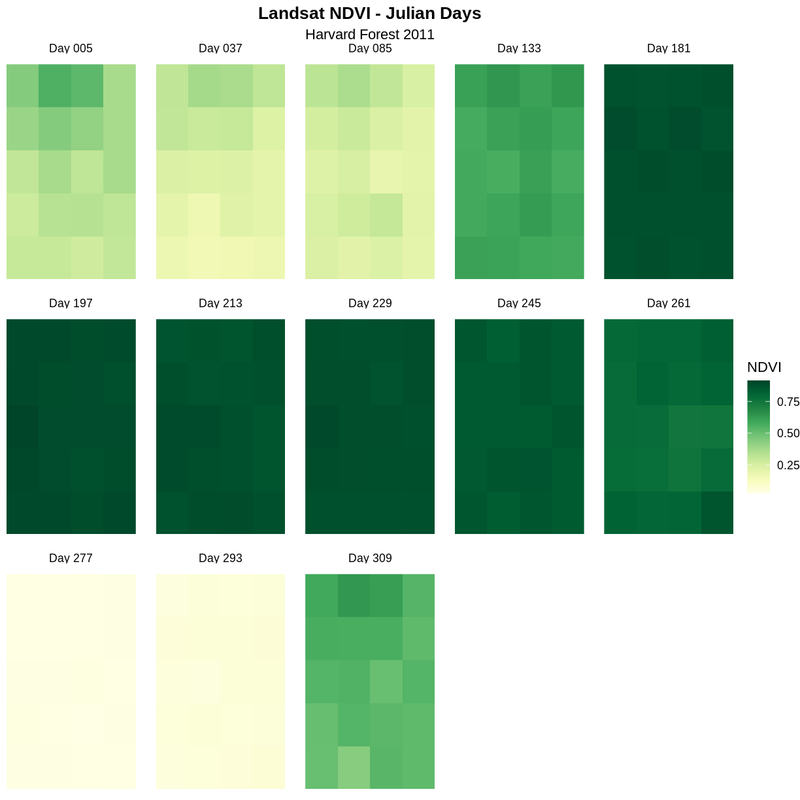 For NDVI data, the sequential color ramp is better than the divergent as it is more akin to the process of greening up, which starts off at one end and just keeps increasing.